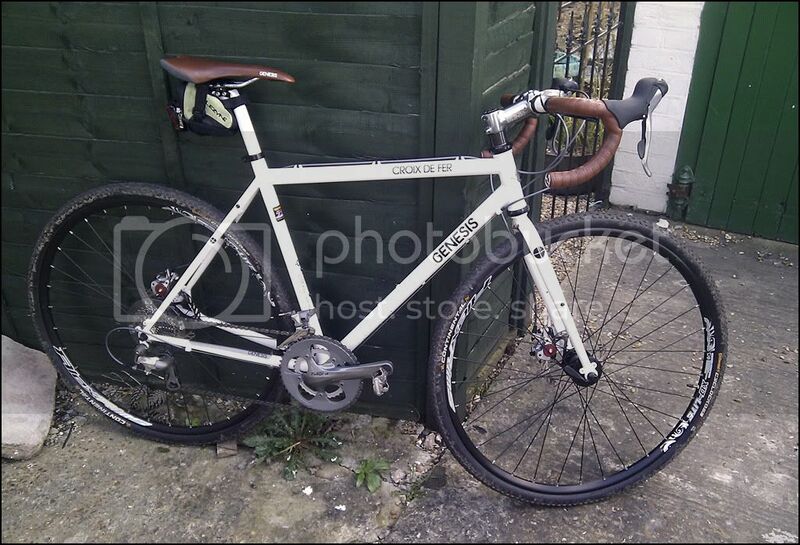 This arrived at Barreg cycles in Chichester over 3 weeks ago, and I've been fighting illness and office bureaucracy/politics since then trying to get my grubby little paws on it. bike update - more than a little disappointed, the headset has started to seize. First noticed it in the middle of last week before a couple of long rides home from work. the handle bars started to have what can only be described as a default position, almost like a notch dead ahead. went out for a good thrash yesterday and I can actually hear the bearings grinding in the headset and the steering is very weird. trying to move it out of forward to turn is a little battle! Organising to book it in for it's service anyway next weekend, so will have to talk to them about that. not good on the headset front. sounds like it was too tight to start with? may of course just be a bit of dirt got in there. One of the bikes I love. I have a frame + fork at home. Next week I go to build up this frame for someone. It's always sad....I want to ride that bike by myself. It's build up with a complete SRAM force and other black stuff. But, after the first bad luck.......It never fails anymore!! Back off the pre-load a bit - it that doesn't cure it, then remove the forks and turn the headset bearings (not the cups, just the ball races) through 90° and then reassemble. So that "straight ahead" is now in a different position on the races, in other words. I know you shouldn't have to do this at a month old but these things happen (like Shimano hubs adjusted far too tight when they come from the factory). Thanks for the advice, help and encouragement guys. I'm actually quite surprised at how such a minor thing has knocked me. I know its a simple fix, and that it had better all still be under warranty etc, but i'm really rather depressed about it. It's an hour long drive to the bike shop, so hopefully the missus and I can spend the day in Chichester next weekend whilst it's being sorted. Not sure what headset to have it replaced with, as listening to you guys and chatting to my mate at work, it sounds like their own branded (el-cheapo?) headset hasn't been up to the job at hand. Any suggestions? @ Andy R - I agree and thanks. Normally I would get straight on this and fettle away til it was fixed, but this bike is less than 7 weeks old, and apart from a clean and a replaced inner tube i haven't touched it mechanically. I don't feel this issue should have happened at all! not the start to 30daysofbiking and The Peoples Grand Tour i was hoping for though!